Dale Comm is a specialist provider of TV aerial installation in Leeds. Whether you’re looking for experienced TV aerial fitters, repairs or commercial TV installation, we are here for you. For more than 25 years, we’ve worked to provide digital TV solutions and installation to properties of all kinds. Whether you’re looking for commercial or domestic installation services, we are here for you. Our experienced team can also install bespoke home entertainment solutions, including audio system and home cinemas. If you’re looking for TV aerial installation in Leeds, CCTV or Access Control services, get in touch today. Here at Dale Communications, we are extremely proud of our reputation in Yorkshire. Our team are committed to delivering high-quality solutions, excellent customer service and cost-effective options for all our customers and clients. 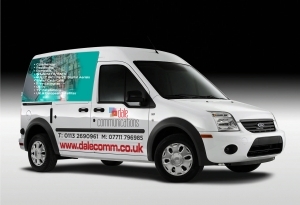 The Dale Comm team is based in Leeds but can provide a national service to suit your needs. We deliver the best possible service to all our clients and customers and our main goal is to leave you fully satisfied. The Dale Comm team is made up of experienced TV aerial installers in Leeds. All our communication engineers are passionate about their work and are dedicated to delivering the best possible service to all our customers and clients. All Dale engineers are also kept up to date with the latest technologies to ensure we can deliver the best possible service. If you’re looking for TV aerial installation in Leeds, Satellite TV installation or reliable CCTV systems, get in touch today. Our expert engineers are always on hand to provide impartial advice to help you find the perfect solution for your needs. All our engineers are fully certificated and trained to the highest standard within the Digital TV aerial installations industry. We also provide satellite installation, CCTV and fibre installation to suit your property’s needs. Dale Communications is a specialist provider of commercial solutions for a wide range of properties and clients. Over the years, we’ve delivered solutions to Housing Associations, Hotels, Hospitals, Sheltered Housing and Councils. Our experienced team can provide a complete range of design and installation services for all IRS, Fibre IRS, MATV, SMATV, CCTV and Access Control in Leeds and across the UK. Our experienced team can provide a smooth, cost-effective and timely project to suit your needs. Are you looking for trusted TV aerial installation in Leeds? Dale Comm has worked for more than 25 years to provide professional installation services across Leeds and the UK. Call Dale’s experienced team for TV aerial installers today! Based in Leeds, Dale Comm’s experienced team can install digital aerials of all kinds. If you’re having any issues with your TV’s reception, we are here for you. Our experienced team cover all of Leeds and Yorkshire and install Freeview/Freeview HD digital aerials. The engineers at Dale Comm believe that everyone should be able to enjoy great entertainment at home. Our team install FreeSat systems so you can take advantage of the best technology without monthly bills. FreeSat provides more than two hundred digital channels via expert satellite dish installation. If you want to take advantage of the great variety and reliability that Sky TV provides, Dale Comm are here for you. Our TV aerial installation in Leeds services can help you to view the stunning HD content from Sky’s variety of programmes and channels. For more information, get in touch today! Dale Comm Leeds install satellite systems which provide foreign TV coverage There’s a huge range of foreign channels available on numerous satellites. With an 80cm dish and a satellite receiver you will be able to receive hundreds of free stations. If you want to watch your satellite TV anywhere in your property then Multiroom TV could be the answer. A multiroom system allows you and your family to watch different digital TV channels in different rooms of your house. For more than 25 years, the Dale Comm team has provided TV aerial installation in Leeds and across Yorkshire. For commercial aerial installation services by a fully-trained and certified engineer, get in touch today. We are the No. 1 provider of commercial installation services for TV aerials and other essential systems. CCTV has rightly become the Universal tool to help with the mundane role of watching over either our homes or business premises. Used as a deterrent or simply ensuring the safety of loved ones, employees or personnel possessions it is the silent but ever watching eye. Fibre IRS, IRS, MATV, SMATV Communal Distribution Systems. Dale Communications have started updating our housing stock to Sky Plus, We have had no problems and have a good working relationship.They have a fantatsic ethic with customer relations and always rectify any problems, quickly and efficiently. Dale Communications have also installed many CCTV systems on our sites at a very cost effective price and to the highest standards. I have no doubt with Marcs experience in the Trade, that his company will go from strength to strength. Marc has worked with us at Accent group for several years and has given us fantastic service and workmanship on all our updated system sites. Dale Communications still remains our approved contractor. Impressive – Working with Marc and the team has been great. They do exactly what it says on the tin and more. Meticulous in their work and has a wealth of knowledge. I have no hesitation in recommending him or his company to any other company. Marc has worked with us at Leeds & Yorkshire housing for many years and we have a fantastic working relationship. He updated our full housing stock in 2009-2010 and has continues to maintain our communal blocks. I have no problem in recommending him and his company to anyone. Dale Communications arrived promptly to sort out my reception problems and fitted a new Digital Aerial, which was fitted quickly and professionally – I would recommend them to anybody. Great service, They arrived with the all the equipment and ladders to reach our very high roof. fitted a new digital aerial and several extra points. There was no no mess left as dale communications cleaned up after themselves. I Would recommend Dale Communications to fit a new TV Aerial or sort out your Sky. Very polite and friendly aerial fitters came from Dale Communications to fit me a new satellite dish – We are more than pleased with the new satellite channels and HD picture. Dale Communications Fitted my new LCD TV to my wall in the living room, along with the surround sound. They organised everything from the plastering to the electrician. It looks great and sounds fantastic.